A well-researched biography that seeks to restore the reputation of the doctor satirized in T.C. Boyle’s novel The Road to Wellville (1993) and in the film of the same name. Wilson (Comparative Religion/Western Michigan Univ. ; Yankees in Michigan, 2008, etc.) has done much more than provide a sympathetic biography of the man who headed the once-famous Battle Creek Sanitarium, the name John Harvey Kellogg (1852-1943) gave to the Seventh-Day Adventist’s Western Health Reform Institute when he became its director in 1876. While the author fully explores the doctor’s role there, more important is his examination of the conflicts among various schools of religious, philosophical and scientific thought in the United States at the time. Kellogg struggled to reconcile the science he had learned as a doctor with the teachings of his church; ultimately, his deviation from church doctrines led to his expulsion. Believing that the purity of the body was as important for salvation as the purity of the soul, he developed the concept of biologic living, the rules for which he spelled out in detail in various books and promoted at the sanitarium. The first rule: “Obedience to the laws of life and health is a moral obligation.” Among his many precepts was the forgoing of meat. He taught that since the abandonment of vegetarianism in Eden, the human race has been sliding into decline, manifested by the short life span of modern men. In time, Kellogg became increasingly concerned over what he saw as the threat of race degeneration, devoting the last 30 years of his life to eugenics, the so-called science of improving the human race by controlling heredity. 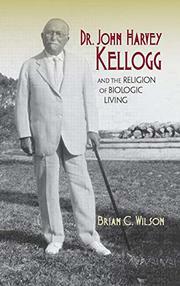 Wilson demonstrates convincingly where Kellogg’s ideas about health reform originated and how they evolved. There’s much here to interest both adherents to and skeptics of today’s alternative and holistic medicines, as well as fans of American history, especially the history of religions.